Sag. Stor. Nat. Chili 160 (1782). Origin and Habitat: Chile, South America. Altitude range: 300-1000 metres above sea level. Habitat and ecology: Naturally, isolated plants, small groups or considerable masses of Puya chilensis are commonly found on arid hillsides, rocky cliffs and gullies, more abundant on the coast and transverse valleys, on north and western facing slopes of matorral areas, and on rounded or flat rocky hill tops. It does not grow in the Andes. Apparently it is a plant that does not support competition and is developed in an environment where competition is scarce. Other conspicuous species on the slopes, particularly when exposed to the north, are Trichocereus chilensis, Eulychnia acida, Acacia dealbata and Puya berteroniana which blooms in a different period, latter in the season (This is probably the reason because there are not known hybrids of both, whether sympatric). Puya chilensis is not considered threatened. It is also cultivated in many parts of the world. In its natural arid environment, plants can be highly flammable and are susceptible to damage from fires that are often the result of human action. Land clearance is an increasing threat. The coastal area is fast developing with resorts and vacation chalets overlooking the ocean and the puyas may not be found here much longer. Description: Puya chilensis is a terrestrial bromeliad, forming considerable masses of basal evergreen, perennial, rosettes with stiff, spiny leaves, from the centre of which an asparagus-like flower stalks rises to 4 m bearing abundant, bright yellow blossoms with orange male stamens in the spring. Flowers produces a fragrant and tasty nectar. Puya chilensis, as its name denotes, is a native of Chile. It is one of the most remarkable of the Pineapple family and is exceedingly handsome when in full flower, in spite of its yellowish-green appearance. Spreading by offsets, Puya chilensis can colonise large areas over time. Rosettes: Loose, basal, with long, stiff, spiny leaves. Leaves: Strap-like, in their apical part slightly arched, about 60-100 cm long by 2.5-3.5 cm wide, with parallel rib and glabrous. Grey-green, blue grey or dull yellowish-green above, lighter green on the underside. Outer two-thirds of the leaf blade poorly ribbed and edged with hooked conical spines which may be an adaptation to prevent herbivores from reaching the centre of the plant. The lower spines with their tips pointing upwards, the upper ones with their spines directed downward. high by 30 cm in diameter at the base, each cluster subtended by a broadly lanceolate bract with acute apex, 7-8 cm long, 4-5 cm wide, hairy, without tomentum. Flowers 15-25 in each raceme, mostly grouped at the bottom of the raceme, diminished by the middle of the raceme, nonexistent at the raceme's end. Each flower subtended by a basal broadly lanceolate olive green bract with acute apex. Flowers: Large, yellowish-green, waxy, bell-shaped, 5 cm long, yellow-green. Outer tepals (3), lanceolate with apex acute 2.5-2.8 cm long, semi-cucculent. Inner tepals (3) forming a cylinder of up to 2 cm wide, with sharp tip, some patent, fleshy, 5-6 cm long. Stamens (6) with glabrous filaments 3.5 to 3.8 cm long and prominent orange anthers to 8 mm long covered with orange pollen. Style longer than filaments, stigma 3-parted. Blooming season: It blooms mainly in late winter to spring (in habitat from September to November). It makes only a few flowers when the previous winter was dry, but if water supply is optimal hundreds of buds open at the top of the stalk and giving the right conditions it can bloom in any period of the years. The bloom continues for a month or more. 7) Rev. Univ. Católica de Chile. 20 (3): 255 1935. 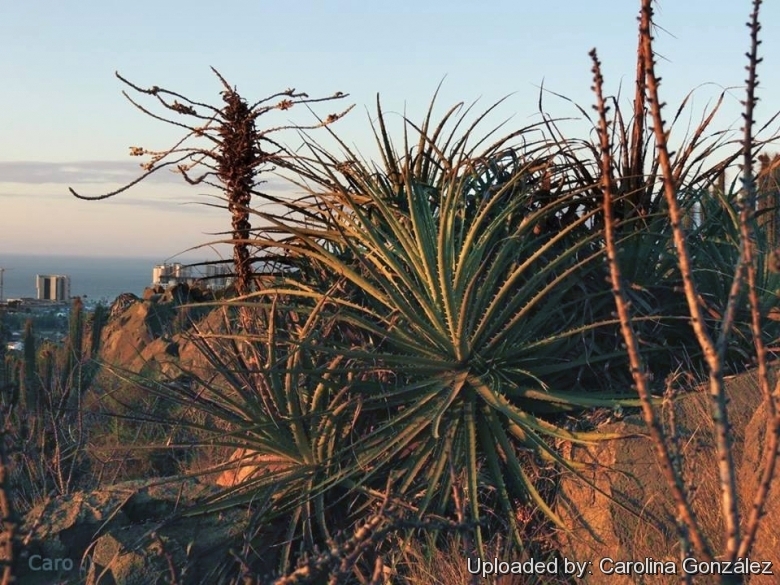 10) "Ficha de Especie Clasificada: Puya chilensis" (PDF). Clasificación de Especies (in Spanish). Ministerio del Medio Ambiente. 2010. <http://www.mma.gob.cl/clasificacionespecies/fichas7proceso/fichas_pac/Puya_chilensis_P07.pdf> Retrieved 21 June 2013. 12) Alyssa Danigelis “Sheep-Eating Plant Opens Up After 15 Years” Jun 22, 2013 , DNews. Retrieved 15 Feb. 2016. 13) Wikipedia contributors. "Puya chilensis." Wikipedia, The Free Encyclopedia. Wikipedia, The Free Encyclopedia, 10 Jan. 2016. Retrieved 15 Feb. 2016. Cultivation and Propagation: Puya chilensis is a compact and carefree slow growing bromeliad not particularly ornamental most of the year, but exceedingly handsome when in full flower. Growth rate: Growth is slow and plants may take 20 years or more to flower. Growing substrate: This bromeliad needs a well drained soil mix comprising equal parts of well rotted compost, coarse river sand (or pumice) and loam and can remain in the same position for many years. Watering: It enjoys regular moisture during the summer growing period, but reduce watering in winter. It, like all Puyas, it’s very tough and drought tolerant. Requires complete and perfect drainage. Give it excellent drainage. Feeding: Apply a very weak liquid feed every month or so over the growing season and a mild solutions (one-quartet strength) of foliar fertilizer at 3-month intervals to both garden and container plants. Apply fertilizer to leaves, roots, and reservoir. Hardiness: USDA Zones: 9-11, Hardy to -6° C. North of Zone 9, this bromeliad is grown in containers that must be overwintered indoors. Pest & diseases: No serious insect or disease problems. Watch for aphids and scale. Mealybugs infestations are also a frequent problem. Rot may develop if soil is kept too moist. Tip: Remove dead flower spikes only. Remove older plant crown when it begins to fade. Container grown plants should be re-potted every other year for good growth when new growth starts in the spring, but only need to be divided every seven or eight years when flowering performance starts to diminish. Use: In warm and temperate climates grow it as a groundcover or accent. in desert or alpine gardens, mixed borders, courtyard gardens, raised beds and rockeries. The plant makes a good potted plant. Traditional uses: The Chileans like to eat the stalk when it first appears, it resembles a big fat asparagus spear which is sliced and used raw in salads much as palm hearts are eaten. Puya chilensis is sometimes cultivated as an ornamental or stove plant in other countries. The soft stem material has been used for corks and bungs and the leaf spines as fish hooks. Fibers from the leaves are used to weave durable fishing-nets. The extract from the long stalk of the inflorescence is used for setting fractures. Nectar of the flowers is applied to an aching ear. Warnings. The plant is believed to be hazardous to sheep and birds which may become entangled in the spines of the leaves. If the animal dies, the plant may gain nutrients as the animal decomposes nearby, though this has not been confirmed. For this reason, Puya chilensis has earned the nickname "sheep-eating plant". Propagation: Puya chilensis is propagated by division of offsets and from seed. The offsets can be detached and repotted when they have reached the dimension of one third of the mother plant. Be sure to provide high humidity for a month after propagating the offsets. Fresh seed germinates in as little as 14 days from sowing. remove seeds from inﬂorescence and lay them uncovered on a bed of of pumice grit; keep constantly but moderately moist. Starting from the seed, 2-4 years are needed for the blossoming, very quick for a Puya, whilst at least 2 years are needed by division.